Holding back the tears, I left to find solace. I headed to the place I go, where peace inevitably descends. It’s funny how the same spot can look so different with the seasons, yet always produce the same effect. One of insight, tranquility, and hope. It’s winter so the lake is frozen. But a day where the 52 degree weather feels balmy after a stint of teens. And I sit. I sit in my beach chair as I always did in the summer. Feeling the warmth of the sun on my face, wrapping the blanket tighter around my ankles. And I wait. I’ve learned that if I wait, something always comes. I never know what it will be …but it always comes. Looking at the shading of the ice, I notice the bright white in the center and the gentle graying on the edges. 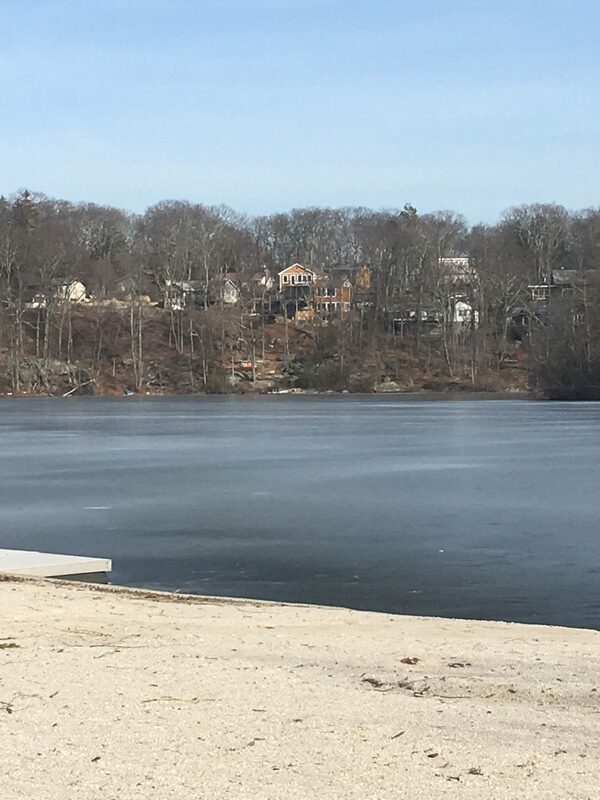 The lake is frozen, but there’s a spot in the right corner near the beach. I get up from my chair and look closer. Yes, it’s true. A splash of water laps up onto the sand. As if a wave under the ice, a wave of movement and hope, refuses to freeze. I feel completely connected to and transfixed by this little wave. I am one with it. Sitting back in the chair, I pick up my journal and pen to begin. It’s about depth. And hope. And love that moves in and through us in even the darkest hours. If you want a better life. More money. Connection. Adventure. Peace. Joy. It must be found at a deeper level than that which society currently resides. Many times, we pass, nod, and mutter, “How are you?” but never wait for the answer. The answer “I’m fine” is both a barrier and a cry to be seen. We barely look up from our computer when a coworker asks for help. We keep reading the paper when our spouse wants to talk. We offer solutions in sales calls instead of asking questions with honest desire to understand. There is incessant tapping of fingers, glancing at watches, and smiles that never fully reach our eyes. We are living in a land of the superficial. We are the ice on a lake in the northeast in winter. Cool on the surface but with a raging desire for more in our hearts. If you want a different quality of life go deeper. Ask better questions. Of yourself and others. Wait for the answers. Inquire again. In each one of us lies a tiny wave of movement and love that has been covered by a sheet of ice. BREAK the ice. Dare to go deeper. Dare to be authentic and vulnerable. Dare to be hurt. Because pain is an indication of life. Living, loving, caring, diving deeper into life enables you to reach a depth of love and connection beyond your wildest dreams. It allows you to become the best version of yourself. It emboldens you to take risks and innovate for success. It cracks open your heart so that genuine compassion for another is inevitable. Please know that I mean what I say. If you reach out with questions or comments and an openness of heart, I will respond and help however I can. Email me at Heather@HeatherHansenONeill.com.